Camp Turtle Island erected a tipi in front of the PUC offices and members spent the night there. In a month, the Minnesota Public Utilities Commission (PUC) is expected to take a final vote on key permits for the Enbridge Line 3 tar sands pipeline through northern Minnesota. 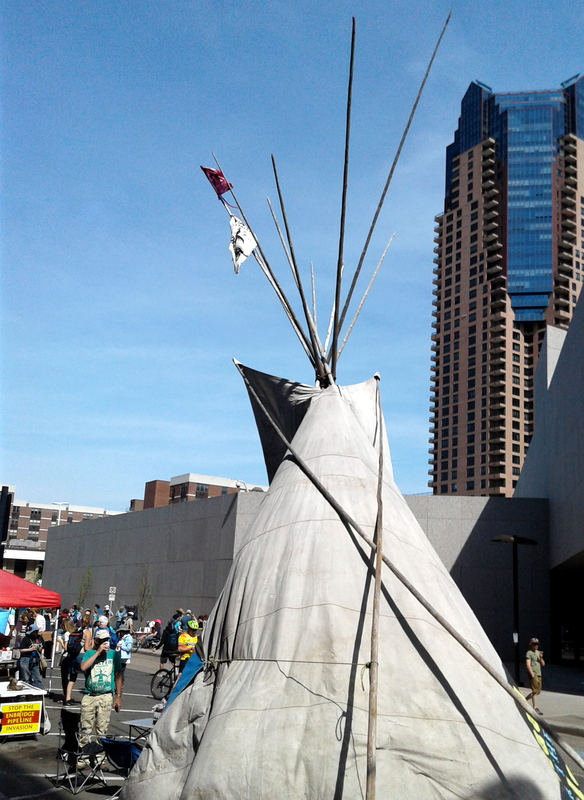 Indigenous and environmental groups kept up the pressure opposing the project by hosting a two-day Block Party right in front of PUC offices in downtown St. Paul. It was called the “Block (Line 3) Party at the PUC,” and it was both a celebration and an act of resistance. The May 18-19 event included a meeting with Gov. Mark Dayton’s staff around pipeline issues, a community meal prepared by indigenous grandmothers, a silk screening tent, a water ceremony led by Sharon Day (an Anishinaabe Water Walker), community education, Line 3 updates, and a music concert featuring Annie Humphrey, Jayanthi Kyle, Thomas X and See More Perspective. 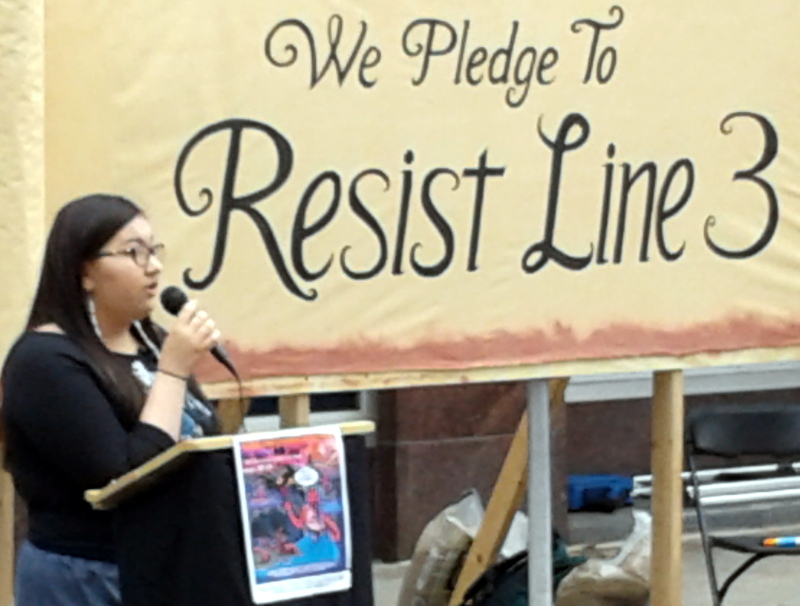 Rose Whipple, one of the Youth Climate Intervenors, spoke. Line 3 is a bad idea, a proposal putting the interests of Canadian oil transportation giant Enbridge and larger oil processing firms over the interests of Minnesotans. Approving Line 3 would set a bad precedent for relocating other Enbridge pipelines throughout the state, increasing harm to the state’s environment, indigenous peoples, and anyone who cares about its waters. 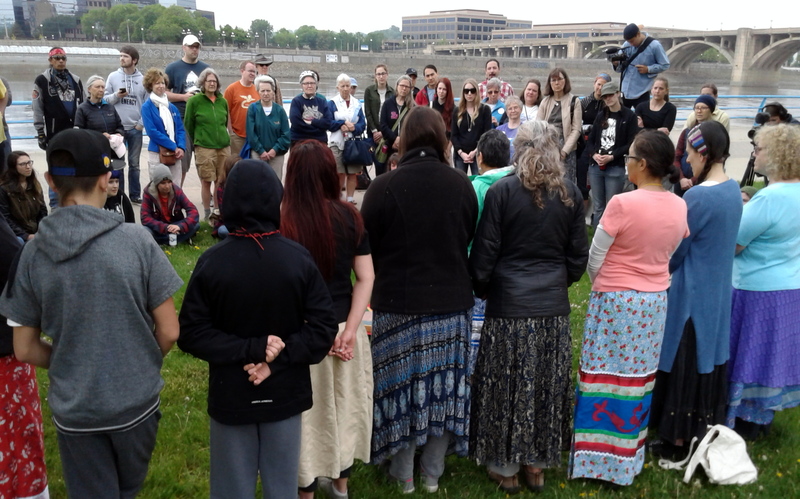 Several hundred people attended the event to show their opposition to the pipeline.